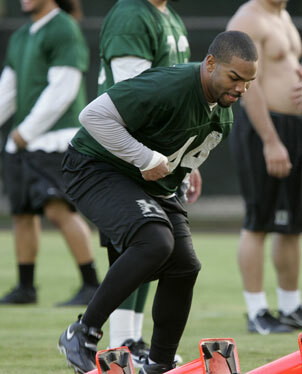 Hawaii linebacker Adam Leonard went through conditioning drills during the team's practice yesterday. "For two days with no pads, there’s a lot of intensity," said June Jones. For the second day in a row, the Hawaii football team spent a good amount of its practice time yesterday working on conditioning. "It's good, kind of get us back in the mood, get our little muscles working," said defensive captain and starting tackle Mike Lafaele. Lafaele was among the Warriors who tried to remain in good physical condition after having 11 days off since the Dec. 1 victory over Washington to complete the regular season 12-0 and earn a berth in the Sugar Bowl. 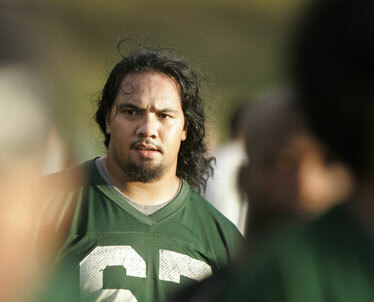 "I worked out and did some running with the rest of the D-line," Lafaele said. Starting slotbacks Davone Bess and Ryan Grice-Mullins took it easy for another day, letting nagging ailments continue to heal. They'll be back at practice next week. Safeties Desmond Thomas and Keao Monteilh continued to run off the last effects of injuries. Wide receiver Jason Rivers had yesterday off for a good reason: He's getting married today. The team was in even better spirits overall than it was Thursday. Yesterday was the last day of finals. Coach June Jones said he noticed that the Warriors were pumped up more than usual. "For two days with no pads, there's a lot of intensity," he said. UH has the weekend off and returns to practice next week. The team leaves for New Orleans on Christmas. Hawaii starting defensive tackle Mike Lafaele is focused on stopping Georgia's rushing attack in the Jan. 1 Sugar Bowl. Parts of Mike Lafaele's trip to New Orleans will be a vacation with his wife. But he'll definitely be working on New Year's Day. Lafaele and fellow starting tackle Fale Laeli are the first line of defense as Hawaii aims to stop Georgia's running game in the Allstate Sugar Bowl. The Bulldogs are puppies on offense with three freshman linemen and first-year running back Knowshon Moreno. But they've got a lot of bite. "We don't take them lightly, although they're young," Lafaele said. "We're just going to go out there and play how we play, every week. We're not too concerned about what they do, but more about what we do." UH coach June Jones said Lafaele and his mates up front will have to play their best game of the season for the 10th-ranked Warriors to upset the No. 4 Bulldogs. "Our D-line's going to have to be physical in there. More physical than they've ever been. If this guy (Moreno) gets started and gets into the secondary, he can break tackles and run away from everybody. "They're playing like veterans. I watched the running back, and he's special physically, also as a blocker. He looks like one of those 5-11 guys who goes about, 205, 210. Just a stud." Moreno rushed for 1,237 yards (second only to Herschel Walker among UGA freshmen) and 12 touchdowns. 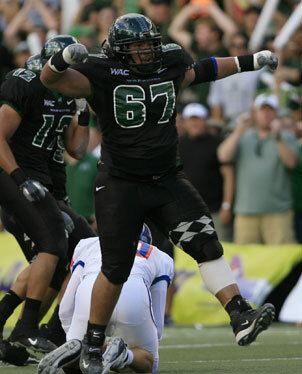 UH coach June Jones says Lafaele "has been the leader on the field for us. A real great kid and player for us." Lafaele made the Western Athletic Conference first team, based mostly on his consistent ability to keep linebackers Adam Leonard and Solomon Elimimian free to make plays. Both made triple digits in tackles, and they can thank the man they nicknamed "Turtle" for many of them. "He's probably our most spiritual leader," Jones said, "from January on. He led the offseason training and has been the leader on the field for us. A real great kid and player for us." The 6-foot-1, 300-pound former offensive lineman thrived, despite a variety of injuries. He enjoyed the 11 days off since the end of the regular season. "Everything's good, everything's ready," said Lafaele, who graduates next spring with a sociology degree. "Just trying to get back into the groove. Pretty much focused on school these last two weeks, today was the last day to turn in papers and stuff." Lafaele's wife, Teri, is going to New Orleans. She's taking vacation from her job as an assistant manager at the Demo clothing store at Pearlridge. Their three young children will stay with relatives. "We're trying to spend as much time as we can with them now," Lafaele said. "My son's birthday is the 22nd. So we'll have a couple of family dinners before we go. "She's really excited about it. We took the kids to the last bowl game and it's just too much of a hassle for us. This is just me and my wife, kind of like a honeymoon." Thanks to some quick healing, starting strong safety Jake Patek is just about at full strength and practiced the last two days. Patek incurred a high ankle sprain while trying to block an extra point in the first quarter of the Warriors' final regular-season game Dec. 1 against Washington. He did not return to the game. "It gets better and better," Patek said. "It's a walk by faith; just go out there and play on it. It feels great, it's not hindering me in any way." His explanation for the speedy recovery: a little divine influence. "Everybody keeps telling me, 'high ankle sprain, you shouldn't be back already," Patek said. "They're trying to tell me I didn't have a sprain. (But) if I didn't have a sprain I would have played in the game. The Lord healed me." The other starting safety, Desmond Thomas, is expected back soon. He's battling a hip pointer, also suffered early in the Washington game. Keao Monteilh started in Thomas' free safety spot the first half of the season, but a fractured shoulder blade caused him to miss the last four games. He doesn't have medical clearance yet, but could by Monday. "Coach Jones thinks I have a great chance to play (in the Sugar Bowl)," Monteilh said. "He told me be out here Monday and start running around. So I will. "He said, 'You gonna let a doctor tell you what to do?' I guess not." Slotback Miah Ostrowski can't suit up until January because he's grayshirting. But the freshman from Punahou can participate in conditioning drills. "I wish I was part of this team," Ostrowski said. "It's the first time in history (to a BCS bowl game) and you don't know when it will happen again. Kind of bogus, but I want to be out here to support the team." Ostrowski was a Star-Bulletin all-stater in football and basketball. He said he's still thinking about playing hoops eventually at UH. "I might, but this is what's paying my schooling," he said.